In 2002, the iconic American sports car underwent some changes that refined the coupe and convertible models of the 2002 Chevrolet Corvette. However, one of the most memorable events that took place was the introduction of the quickest Z06 Corvette (at that time). Along with Z06 option package that was reminiscent of the 1960s legendary Z06, General Motors also improved the handling, suspension, and performance of their convertibles and coupes. When you first look at the 2002 Chevrolet Corvette, you might think that it is only a reproduction of the 2001 models. However, the engineers wanted to create a total performance package with the 2002 Z06 that maintained the balance that the Corvette had become known for. With this goal in mind, General Motors looked at every aspect and function of the 2001 Z06 and searched for the areas that they could refine that would make the most noticeable performance improvements. Their efforts were not in vain; they ended up with the fastest Corvette to ever be manufactured, at least, at that time. 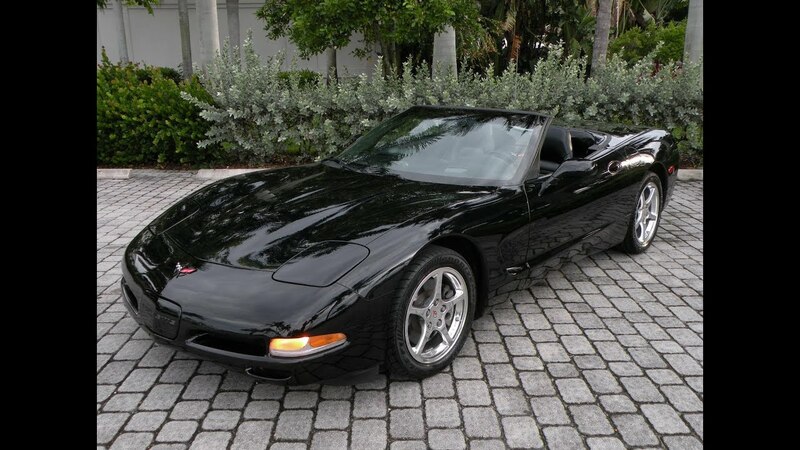 The 2002 Chevrolet Corvette coupe and convertibles were powered by the 350 HP LS1 and came mated to a 4-speed automatic as the standard powertrain. This setup provided the driver with 350 HP and 489 lb-ft of torque at 4000 rpm. A 6-speed manual transmission was also available as an optional feature. It helped to create 508 lb-ft of torque at 4400 rpm. For the exterior, consumers could select from a variety of colors, including the new Electron Blue. However, two colors were discontinued for the 2002 models, Navy Blue Metallic and Dark Bowling Green Metallic. Other than these three changes, the color options basically remained the as with the 2001 models. Convertible top color options were limited to white, light oak, and black. Both styles had P245/45ZR-17s on the front and P275/40ZR-18s on the back. Stopping power was provided by anti-lock 12.6-inch disc brakes at the front and anti-lock 11.6-inch disc brakes on the rear. However, the magnesium wheel option was not made available to the coupes or convertibles for 2002. For those that wanted performance-level handling, they could opt for the Z51 Performance Handling Package. The package included an aluminum automatic transmission case, lighter than the previous version, and stabilizer links that are constructed of cast aluminum. For sound, an AM/FM in-dash CD system was the new standard feature in 2002. However, for consumers that selected the remote 12-disc CD changer, they could choose between an AM/FM CD radio or an AM/FM cassette system. While the coupe and convertible 2002 Chevrolet Corvettes were impressive, the Z06 is what stole the show, much as it did in 2001 when it was introduced to the world. Along with 20 additional HP over the 2001 Z06, General Motors refined other areas that helped to make a great sports car even better. The refined LS6, 5.7 Liter motor is vastly improved on over the previous years’ model. Part of the reason for the added HP is due to a camshaft with a higher lift, hollow stem valves, a redesigned low restriction air cleaner, and a mass air flow sensor, MAF, that was less restrictive. 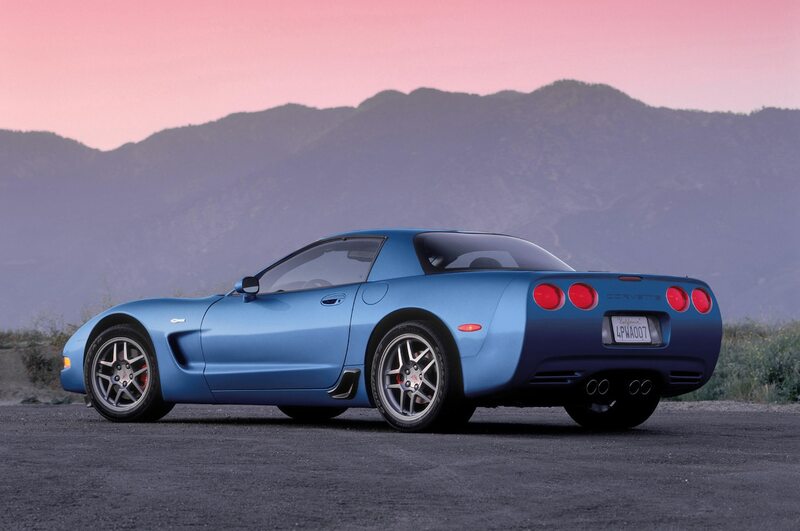 Along with the motor, the 2002 Chevrolet Corvette Z06 also had upgrades done to its suspension. Camber settings were changed, a larger stabilizer bar was added, and the rear leaf springs were stiffened. New shock valving was also added to the rear. These improvements helped to ensure that the driver had optimal control, even at high speeds. Other improvements to the Z06 that helped with handling is the Active Handling system. It comes as standard equipment and helps to prevent rear-wheel lockup with dynamic rear brake proportioning. Also included in the system is integral traction control; it lets drivers experience the power and handling of the Z06 while maintaining wheelspin control. “Competitive Mode” lets drivers enjoy the benefits of the Active Handling system without the restrictions of traction control. Improvements also include the Heads-Up Display or HUD. The HUD projects the information, such as speed, onto the windshield. While the HUD came as a standard feature on the Z06, it was an optional feature for the coupes and convertibles. Those models that came equipped with the HUD had a thinner windshield than those that did not have it. Thankfully, there are plenty of sites and groups available to provide hard-to-find parts and information for the Corvette fanatic. Here are some useful sites that you can use for maintaining or repairing your iconic sports car. NationalCorvetteOwners.com. While there is a fee for joining this Virginia based Corvette fan club, membership does have its benefits. Along with access to parts, performance components, and useful information regarding everything related to Corvettes, members also receive special discounts for certain services. For example, you can get 20% off for home and auto insurance if you use MetLife. Z06VetteOwners.com. For those that are dedicated fans of the Z06 Vettes, you need to take a look at this site. Whether you are looking for a place to buy a Z06 or looking for upcoming events, it has it all. CorvetteForum.com. Vette owners looking for a place to connect with other owners should take a look at CorvetteForum.com. This site is loaded with other Corvette fans that are more than willing to share what they know about Corvettes with other members of the forum. While many would find it a challenge to improve the Corvette any more than it already is, there are those that want to add their own unique components and accessories to separate theirs from all the others. For those Vette owners, they are in luck. Thanks to the Corvettes popularity as a dominate sports car, there are plenty of sources for customization kits and aftermarket performance parts. The 2002 Chevrolet Corvette Z06 turned heads with its impressive speed when it left the production lines and landed in the showrooms. Keeping what worked and refining them to make them even better ensured that this Vette will eventually take its place along with the other classic Vettes.